Buy Obbekjaers Japanese Oil of Peppermint 10ml in the UK from our online shop or directly from our independent Scottish store. 100% pure japanese oil of peppermint. 10ml of the finest Japanese peppermint oil. Directions: Mainly for external use although it can be taken internally with warm water. Massage gently into the skin. Avoid contact with eyes. Applications: Any aromatherapy applications. Also can be used to relieve the symptoms of aches, pains, cramps or stiff joints. Warms and sooths as it sinks into the affected area. As official Obbekjaers stockist, we sell genuine Digestive Aids directly from our shop in Scotland and online throughout the UK. 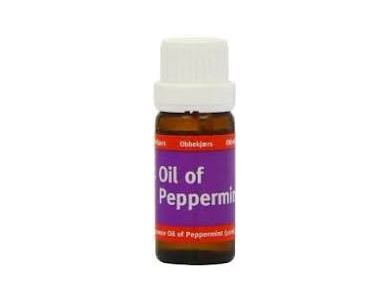 Obbekjaers offers a wide range of obbekjaers peppermint, peppermint supplements, peppermint oil and much more. View more products from Obbekjaers. Where can you buy real Oil of Peppermint 10ml safely online? If you are wondering where you can buy Obbekjaers Japanese Oil of Peppermint 10ml safely online in the UK, then shop with us. We are an actual health foods shop; with real people selling real foods and products. Our award-winning independent shop is located in Stirling, Scotland since 1976. You can buy our Peppermint supplements and other genuine Digestive Aids in store or safely place an order with us online or over the phone. Oil of Peppermint 10ml - Obbekjaers Japanese Oil of Peppermint 10ml in Digestive Aids and Herbal Remedies, Tinctures & Supplements.